Bongard problems are a class of problems in visual pattern recognition first described in the appendix of a book by the Russian scientist M. M. Bongard in 1967 ( M.M. Bongard, Pattern Recognition, Spartan Books, New York, 1970). 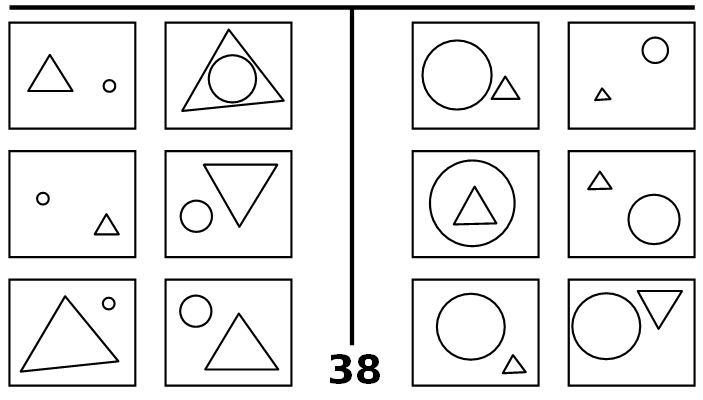 Here is problem #38, redrawn from the book and HERE is a link to a very entertaining website devoted to these problems by cognitive scientist Harry Foundalis. There are six boxes on the left, and another six on the right. 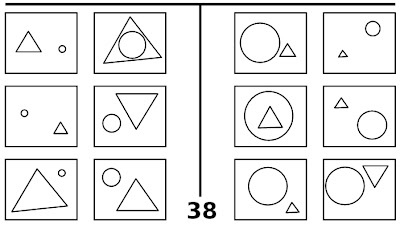 The ones on the left conform to a pattern, or rule, that describes them, and the task of the problem-solver is to find this pattern, or rule. As an aid, the six boxes on the right do not conform to the same pattern. Sometimes they conform to a different pattern, while in some cases the rule that describes them is simply the negation of the rule on the left. (Thus, the six boxes on the left are the ones that, somehow, have the official status of defining the pattern.) There is nothing magic about the number six — it’s just that Bongard decided to provide six examples and six counter-examples for each of his 100 problems in the original publication and so BP’s are normally designed with 12 boxes thereafter.